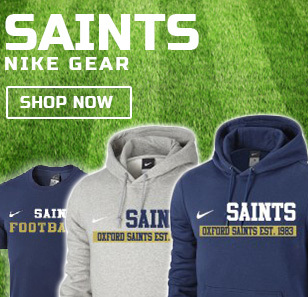 Set up in 1983, the Oxford Saints are one of the oldest American Football teams in the UK. The brainchild of Steve Abbott, the team began life as the Oxford Eagles, but following a Radio Oxford phone in competition the team was renamed the Oxford Bulldogs, and they began playing in earnest in 1984. Bulldogs contemporaries at the time were such illustrious Britball names as the London Ravens, Heathrow Jets and Stock Exchange Stags. The Bulldogs first 3 organised games were won and set the tone for a long and successful future. As American Footballs popularity increased the first British league was formed, and in 1985 the Bulldogs officially joined the AFL. The Bulldogs stormed through a hugely impressive first season with an 8-1-1 record, being defeated only by the mighty London Ravens at the quarter final stage of the playoffs. The Budweiser League then morphed into the Combined Gridiron League and then the CMAA, an unsettled period in Britball’s history matched by the Bulldogs distinctly average 4-6 records over each of those 2 seasons. 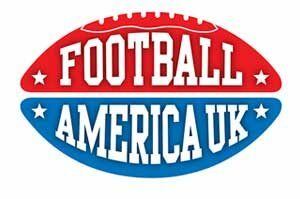 1991 saw a quantum leap in the structure of American Football in the UK as the British National Gridiron League (BNGL) was formed. It was a period of stability within the game that was matched by the Bulldogs increasing success. Instrumental in this success was American head coach, and former Chicago Bear, Steve Conner. Coach Conner led the team to a 9-1 record and the clubs first playoff appearance for 4 years, defeated once again at the quarter final stage in a thriller against Sutton Coldfield. 1992 saw the Bulldogs move into a new era as they became the Oxford Saints. Driven forward by their tireless and inspirational General Manager, Roger Hedges, the club secured their first major sponsorship deal and moved to a new home at the Oxford Stadium in Cowley. Another fine 8-2 season followed but yet again the Saints fell at the quarter final hurdle, this time to the DeLonghi Knights in Farnham. It was the same story the following year as the Knights and the quarter finals proved too big a hurdle to overcome. Prior to the 1994 season Coach Conner returned to the US leaving a legacy of professionalism, pride and talent that would serve the Saints well. Richard Emerick, another experienced US coach picked up the reins and although the Saints failed to make the playoffs. After a 6-4 season things were beginning to take shape. An experienced squad led by the inspirational BJ Johnson at quarterback featured myriad offensive talents; running backs Nick Whitford, Billy McMahon and Jason Lowe ran behind a huge and powerful offensive line of Steve Abbott and Everett Mclean, and Steve Belcher led a fleet receiving corps. The defense was equally potent with no nonsense defensive lineman Morris Coleman, the Whitford brothers, Nick and Paul, joined by a young Andrew “Snake” Day, Danny Hawkey and a talented secondary featuring Nick Wykes, Iain Noakes, Kevin Joseph and American Airman Scott Grady. The wheels threatened to come off during the 1995 season when the inspirational Emerick was forced to return to the US for family reasons. Long time Bulldog and Saints Linebacker and defensive co-ordinator Chris Janes stepped up and took the Head Coaching role mid way through the 1995 season. Finishing the season with a 6-3-1 record in BNGL Division 3, which featured a last gasp tie with the London Blitz, the Saints made the playoffs albeit facing every game away from home. After the (now defunct) Invicta Eagles were swept aside in the first round the highly fancied London Blitz and then Colchester Gladiators were vanquished in epic confrontations leaving the Saints to face the Gwent Mustangs in the final at Leicester’s Saffron Lane Stadium. A 14-6 victory, inspired by MVP Snake Day, followed and the Oxford Saints were finally champions. The Saints subsequent promotion saw them placed in BNGL division 2 for 1996, and after a respectable campaign league restructuring saw them competing in division 1 in 1997. A superb 9-1 season behind second year quarterback Wayne Mayers had the Saints going all the way to the semi finals where they were defeated by the Nottingham Caesars. Disappointing campaigns followed and when the league was restructured again in 2000 the Saints found themselves in division 2 of the British Senior League. A 7-1 campaign in 2000 was followed by an impressive 8-0 season in 2001, both ending in semi final disappointment at the hands of the PA Knights and Ipswich Cardinals respectively. After a poor 2002 season Coach Janes moved upstairs as Director of Football and Phil DeMonte took over as Head Coach. Coach DeMonte only stayed at the Saints for 1 season, as work commitments took him overseas, and the team again made the playoffs eventually beaten by the Gateshead Senators. With Coach Janes back on the sideline for the 2004 season the team compiled a 4-5-1 record before racing through the newly formed BAFL division 2 in 2005. The Saints 9-1 record had them among the favourites for the title but this time the Kent Exiles ended their hopes. However, with the experienced Mayers at QB, the Saints added powerhouse running back Chris Taylor to their 2006 squad and roared through their season 9-1. This time they crowned their achievement by winning the Division 2 title. Behind the powerful running of Game MVP Taylor and the sure leadership of Mayers the Saints came from behind to beat the West Coast Trojans 29-28 in one of the most exciting games ever played on these shores. In 2007, the Saints General Manager, Roger Hedges, sadly passed away. He is well remembered within the club for his contributions to American Football in the UK, and his family are still involved with the club today. Promoted to BAFL division 1 in 2007, consecutive solid seasons of 6-4 and 4-5-1 respectively have seen the Saints cementing their position and gradually rebuilding the squad. Season 2009 saw the Saints take another big step forward. With Chris Taylor again leading a powerhouse running game and Jay Taylor growing in confidence at Quarterback several additions were made to the playing and coaching staff. Long time BAFL offensive wizard Len Scott and former London Olympian Matt Coppinger boosted the offensive coaching staff, Defensive back Nick Wykes returned as player coach after a 3 year hiatus and former Saint and PA Knight Steve Belcher returned at wide receiver and kicker, providing the highlight of the season when he landed a record 57 yard field goal as time expired to defeat the Birmingham Bulls in week 7. As several of the younger members of the Saints squad matured into their roles and began making their mark, the Saints immediately began to click and behind a marauding defence began an assault on the division 1 crown. Led by Andrew Day and Ian Ice Harry and featuring stars in the making such as Chris Ellis and Jonny Dover the Saints defence only gave up 6 points through their first 3 games. Saints hopes of a conference crown were dashed in the final game of the season by a strong Tamworth Phoenix side, the only side to beat the Saints in regular season play and Oxfords season ended one game later in an epic encounter against Cambridge. An 8-2 mark represented huge progress and also a swansong for legendary Head Coach Chris Janes, who retired from active coaching and assumed the role of General Manager. Len Scott assumed the head coaching mantle for the 2010 season. Coach Scott reinforced the Saints roster with an infusion of Oxford Cavaliers players and Rookies new to the sport. The already strong Saints defense was bolstered with the addition of Dean Bryan, Adam Cartwright and Clive Russell, while the offense, under the tutelage of Matt Coppinger, featured rookie running back sensation Kyle Micallef alongside Jay and Chris Taylor and a growing group of young British talent. Competing once again in the South West conference of Division 1 the Saints got out to a strong start before running into the Premiership bound Phoenix, and defeated all but the Tamworth based outfit en route to a 7-3 record and a second straight playoff contest against Cambridge. Confident after the nail-biting encounter of 2009 the Saints were stopped agonisingly short of reaching the Division semi-finals as the Cats prevailed 13-7. With lots of changes happening to the Saints in recent years, 2014 marks a special point in Saints history with the departure of loyal Chairman John Farley. Saints Veteran Martin Fitzpatrick takes the reigns of the club with a mostly new committee to drive the team forwards. On the field, 2014 was a strong year for the team beginning with a huge recruitment drive. Two rookie taster events were held in the early stages of the year which drew strong interest from the local community. The team enjoyed a large input of fresh blood and had one of it’s best rookie classes in recent memory. Along with the large increase in rookies, a number of experienced University players also joined the squad reinforced by the big contingent of existing veterans. The 2014 campaign featured three QB’s at week 1 with OBU Panthers James Sharples and Harry Brookmyre along with Oxford Lancer Andrew McKenzie. Sharples had the starting position secured with McKenzie in the number 2 slot. The year started off in excellent fashion with four straight wins and many predicting Oxford to have an undefeated season. In week 2 the Saints travelled to the Lincolnshire Bombers and although securing the win, they lost 2nd string QB Andrew McKenzie to a season-ending leg injury. This elevated Harry Brookmyre to the 2nd string position behind his University team mate James Sharples. Week 4 saw the Saints take on the equally undefeated Peterborough Saxons in what was called the Battle Of The Undefeated. A statement game against what was assumed the only likely team to cause an upset, and the Saints came away with a big win at home. 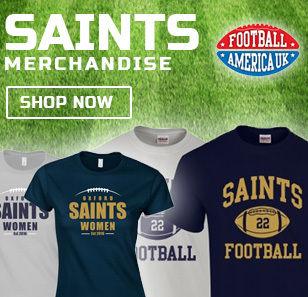 The middle of the year saw the Saints stall and suffer disastrous defeats. In week 5 a huge 26-6 blow was dealt when the team travelled to play the Shropshire Revolution, with the Saints defense giving up three scores within the first quarter of play alone. A 2nd half improvement saw the Saints defense shut down Shropshire and prevent any further scores, but the damage was done and the team failed to catch up. travelled to Oxford and overcome in a close fought game. With two extremely talented American nationals on their roster, the Saints defense struggled to contain their mobile Quarterback and their equally dangerous Runningback. Week 7 saw a nail-bitingly close defeat of 21-20 against the Shropshire Revolultion with a missed PAT being the deciding factor. With three back to back losses, the Saints outlook to reach the playoffs was grave. 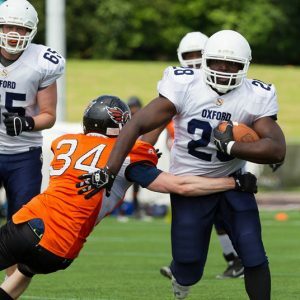 However with a large number of rookies gaining valuable experience in their first year, the tides were to soon change with Oxford finding early season form again. A dominant 39-16 victory over league newcomers Sandwell Steelers in week 8 and then the last road game of the year saw the Saints earn a 33-12 victory over Peterborough Saxons. Due to a shortage of available officials, the Peterborough game was played on a rescheduled date which meant the Saints were missing a decent number of starting players including the majority of the offensive line. With some tweaking however the Saints put together an offensive line with many players also playing defensive line the same game. What could have been a disaster waiting to happen turned out to be one of the strongest displays of the year. 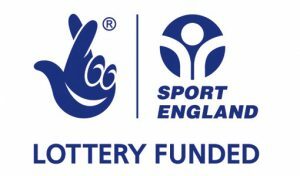 The Saints narrowly missed out on the playoffs due to a tie breaker situation between Oxford and Shropshire, who went on and made it to the semi-finals before being beaten by the Merseyside Nighthawks. 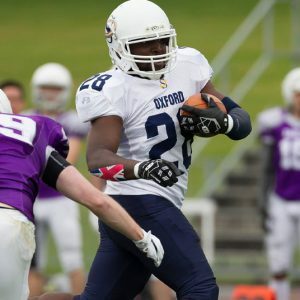 Oxford closed out the year with their 7th win of the season, against the Leicester Falcons. 2015 preparation began early with two hugely successfully rookie training events held in a state of the art 3G Dome facility. With the team looking to return to weekly training in mid-january, the Saints hope to have another strong recruitment year that can rival 2014. Another league restructure now sees the Saints competing in SFC2 West (Southern Football Conference Division II, West) This puts the Saints up against old foes and league newcomers alike. In 2015 the Saints will be taking on Cornish Sharks, Gloucester Centurions, Swindon Storm, Bristol Apache and new team Torbay Trojans. During the offseason, chairman Martin Fitzpatrick stepped down from the role and vice-chairman Andrew Peart was voted in as his successor at the 2015 Annual General Meeting. Building on the successes made by Martin Fitzpatrick to modernise the club, Peart has continued the role and has overseen significant developments. 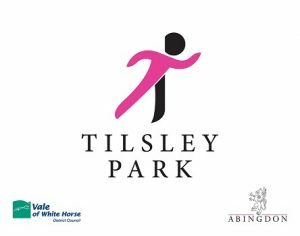 Relocation to Tilsley Park in Abingdon for home games now sees the Saints playing on a brand new 3G field with large changing facilities and covered seating for spectators. 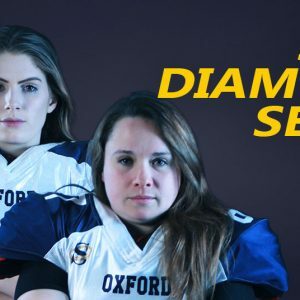 Peart has also laid the foundations for the Oxford Saints Women’s team which began training on 10 May 2016, with 25+ members at its first session. 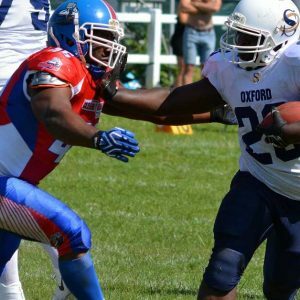 In the offseason, Saints running back/tight end James Walter received an invitation to the Great Britain Lions Men’s team and underwent training with the national squad. Notable additions to the 2016 roster include American nationals Destin Maulding (QB), Bilal Redd (FS), Marlon Mason (CB and Eric Mendoza (LB). Further in the season, Tony Glover (RB) also joined the squad. In August 2016, Ben Denton (QB) returned to the field for the first time after being diagnosed with Leukaemia in 2015. Following treatment and entering remission, Denton’s first game back was against the Swindon Storm on 14 August 2016 and took to the field during the 4th quarter. In the 2016 playoffs, the Saints qualified with the #2 seed behind the #1 London Hornets. For the first round on 21 August, the Saints defeated conference rival the Cornish Sharks in the quarter finals in a 40-3 victory. This secured their advancement to the semi final where they defeated the Bristol Apache 40-19. The Saints progressed to the Division II Southern Final against the Cambridgeshire Cats and won 24-2 , on 11 September at John Charles Stadium in Leeds. At the end of the 2016 season, chairman Andrew Peart stood down and vice-chairman Graeme Taylor was elected to the leading role.